When authors Sam Sykes (The Mortal Tally, An Affinity for Steel) and Chuck Wendig (Star Wars: Aftermath, Blackbirds) had a detailed Twitter conversation deconstructing the horror genre last year, The Truth About Lies who could’ve guessed we’d see that conversation brought to the big screen? But that’s exactly what co-writer and director Brett Simmons did with You Might Be the Killer, a cute, clever, horror film that has plenty of merit, but doesn’t quite live up to its meta-predecessors like Hasta que la boda nos separe The Cabin in the Woods or Scream. 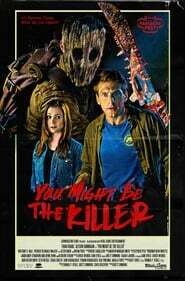 The film begins with Sam (played by Cabin in the Woods star Fran Kranz) calling his friend Chuck (Buffy the Vampire Slayer star Alyson Hannigan) with a problem. He’s at a camp and all the counselors are being killed. Chuck is an expert in horror movies, so she tries to figure out how Sam can survive. And, pretty quickly, the title comes into play. Curse of the Witch’s Doll Maybe Sam isn’t the one who needs to survive…because maybe he’s really the killer.